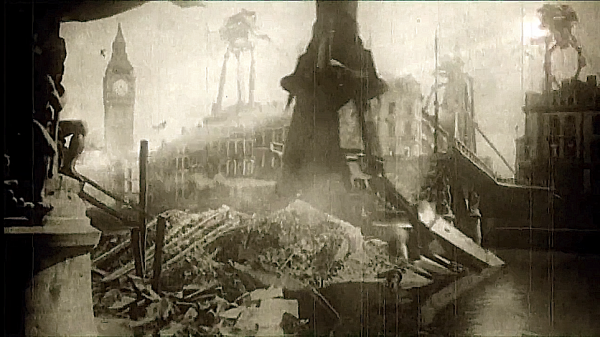 This is a fun, engaging lesson teaching students about War of the Worlds. They are given the opportunity to hear part of the original episode, answer questions, and analyze primary documents. We are going to listen to that broadcast. As you listen to the broadcast, think about the following things, and fill in the questions below. LISTEN VERY CAREFULLY. We will discuss the answers afterwards. Who do you think made the broadcast? Why do you think the broadcast made? How do you think the American people responded to the broadcast after they heard it? If you heard a broadcast like that today, do you think it would get your attention? Answer the following questions about the story itself. What happens during the story? Why might listeners believe the story was really happening in real life? In 1938, there were two main radio shows that competed for listeners during the prime 8 p.m. Sunday time slot: Orson Welles’ “Mercury Theatre on the Air” and “Chase and Sanborn Hour.” Welles wanted to pull listeners from his competition so he turned to his theater background for the Halloween show. He worked with the CBS staff to adapt H.G. 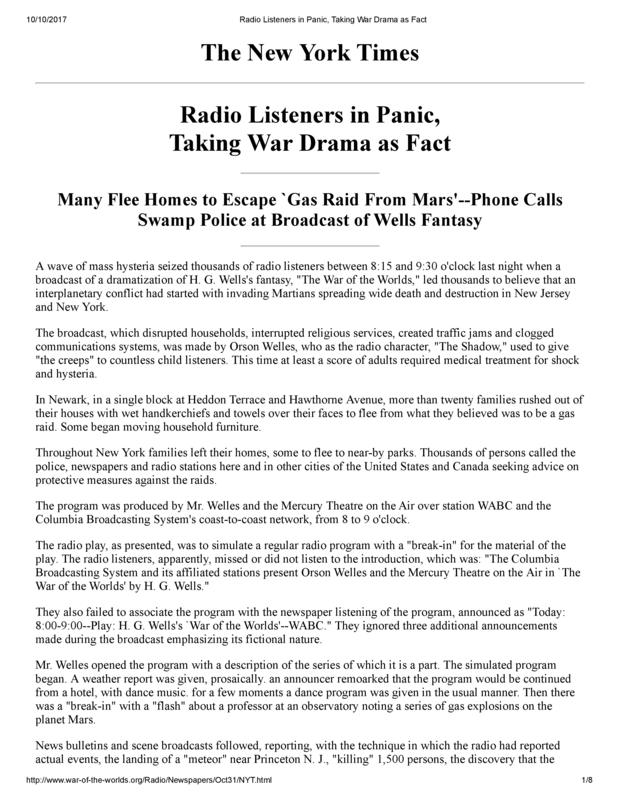 Wells’ novel “War of the Worlds” for radio, updating the setting and shortening the plot. At the beginning of the show, Orson Welles announced that the following broadcast would be an adaption of the novel. 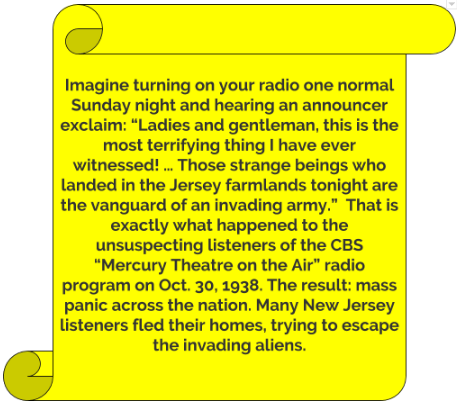 However, most listeners tuned into “Mercury Theatre on the Air” during the musical break of “Chase and Sanborn Hour.” They missed the announcement and only heard the terrifying breaking news bulletins of “eye witness accounts” of creatures with heat ray weapons and interviews with “government experts” describing mass destruction. These reports, combined with the sounds of clanking metal and a screaming crowd, made the experience extremely realistic—and upsetting—for listeners. Within hours, though, listeners realized the report was fictitious and were outraged. Many tried to sue the radio station, but no law had been broken. It was a hard lesson in not believing everything they heard on the radio. Work with a partner. Read the first two pages from the New York Times Article from 1938. Keep in mind this is the original article and they had no computers (or spell check) to correct their typing errors! Answer the questions on the right. Why do you think there were so many typing errors in this article? I mean, it is the New York Times!!! How and why would they make so many mistakes? 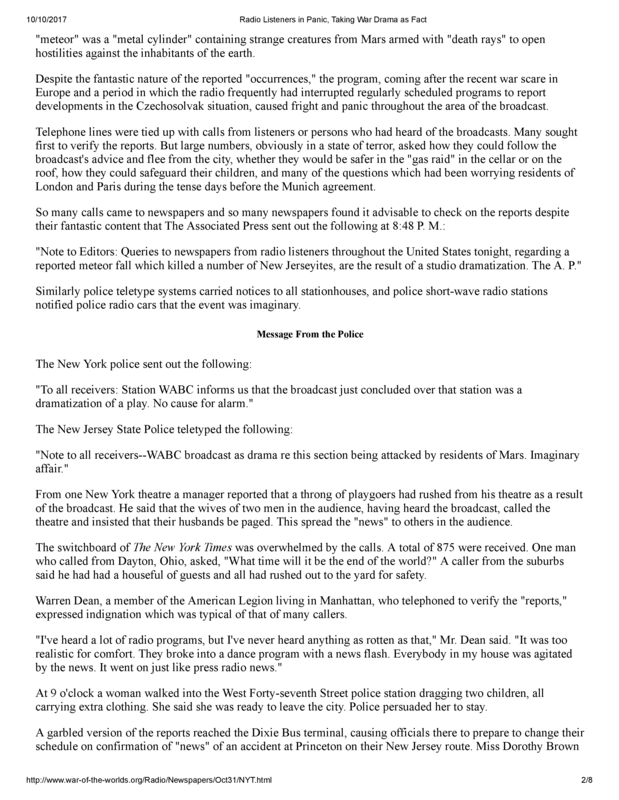 In the first two pages that you read from the New York Time article, what items (evidence) came from the broadcast that made people believe this was truly happening? If you lived in 1938, do you think you could have been fooled by the radio broadcast? Do you believe everything you read? Have you ever been fooled into believing that something saw on TV or read on the internet was real when it was not?